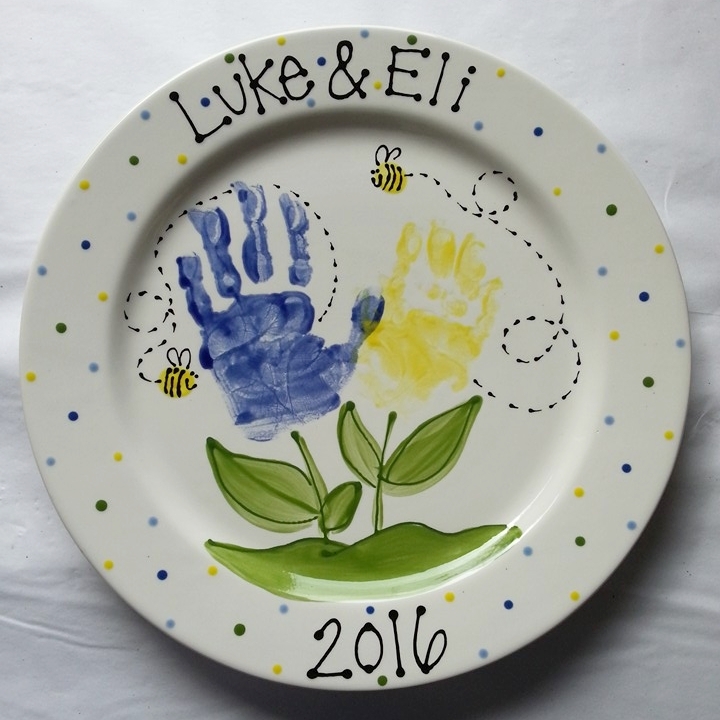 Bring your child in and we will stamp their prints onto pottery. We can custom decorate your piece in one of the following styles or we will happily create a one of a kind unique piece for you based on your design request. 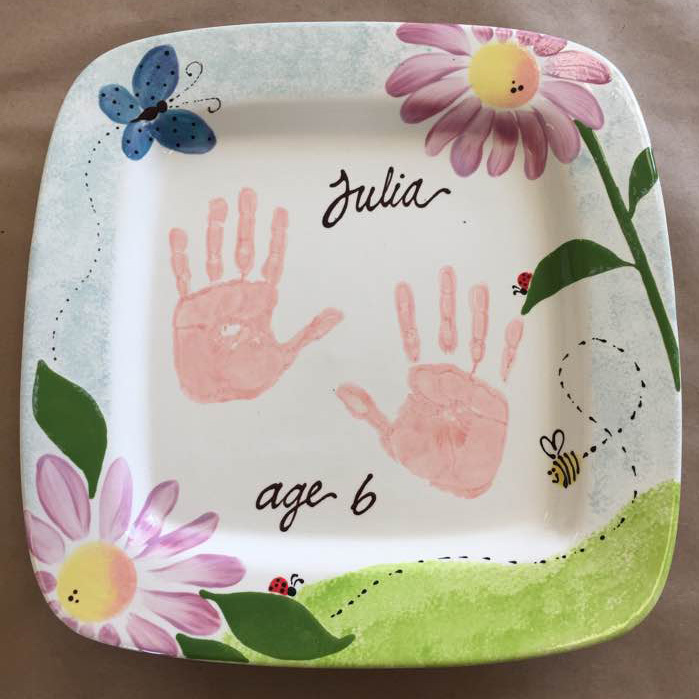 We have many sizes and shapes of plates, platters, mugs, bowls and other pottery fit for a print to accommodate your needs. 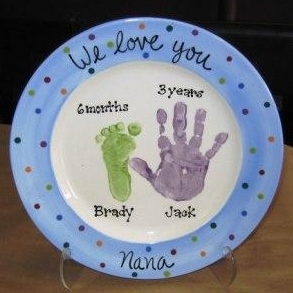 These make beautiful gifts for family, especially for grandparents who already have everything. Surprise someone special with a great gift that your child helped to make. 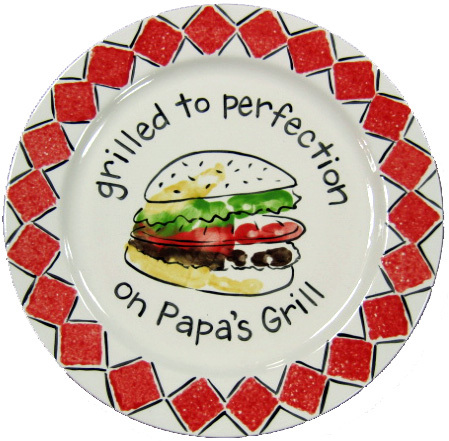 It's a wonderful keepsake and it's a functional work of art too! All our glazes are non-toxic so there are no worries. 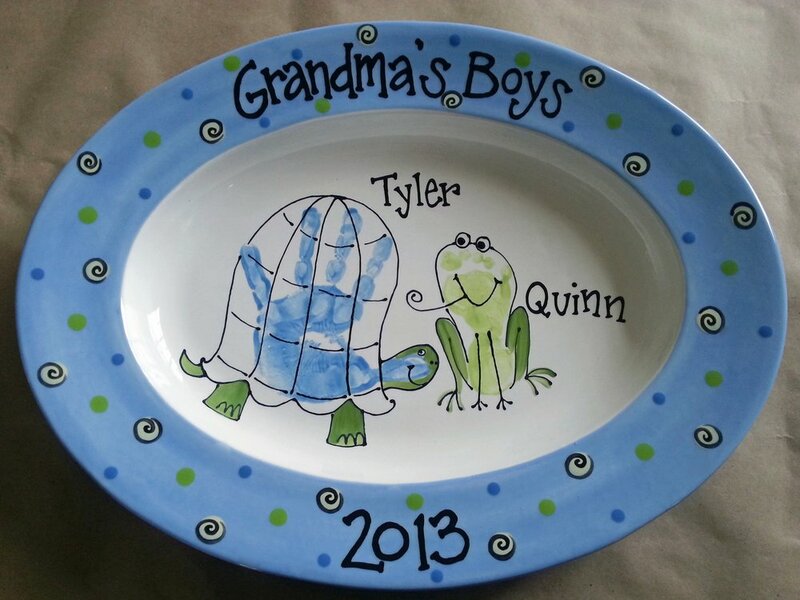 Custom painted pieces are generally ready in 2-4 weeks. Rush orders available on request for an additional fee and can be ready in as little as seven days. 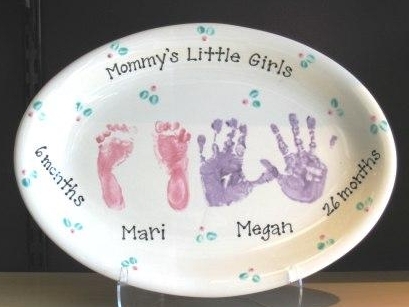 We can also assist with painted pet paw prints on pottery (wow, that's a tongue twister!). By appointment only, you can bring in your leashed and well-mannered pet to get their paw stamped. We recommend that you have your pet's paw hairs trimmed between the pads as it improves the quality of the print. We suggest you bring a helper with you so that your pet can go home immediately after and not have to sit around and wait for you to finish painting as our studio is just so fun and relaxing, you won't want to leave. 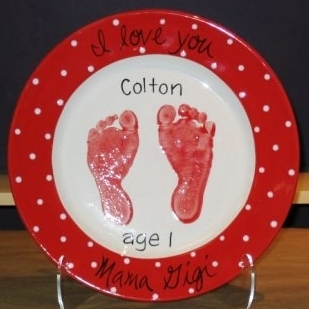 Clay Imprints are slabs of clay you get to press your or your child's hand or foot into. 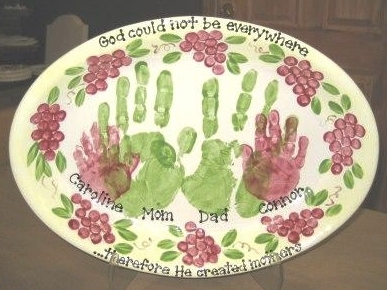 We will shape them into several wall hanging plaques that make a special keepsake or an excellent gift for loved ones. We also offer address plaques and ornaments too. 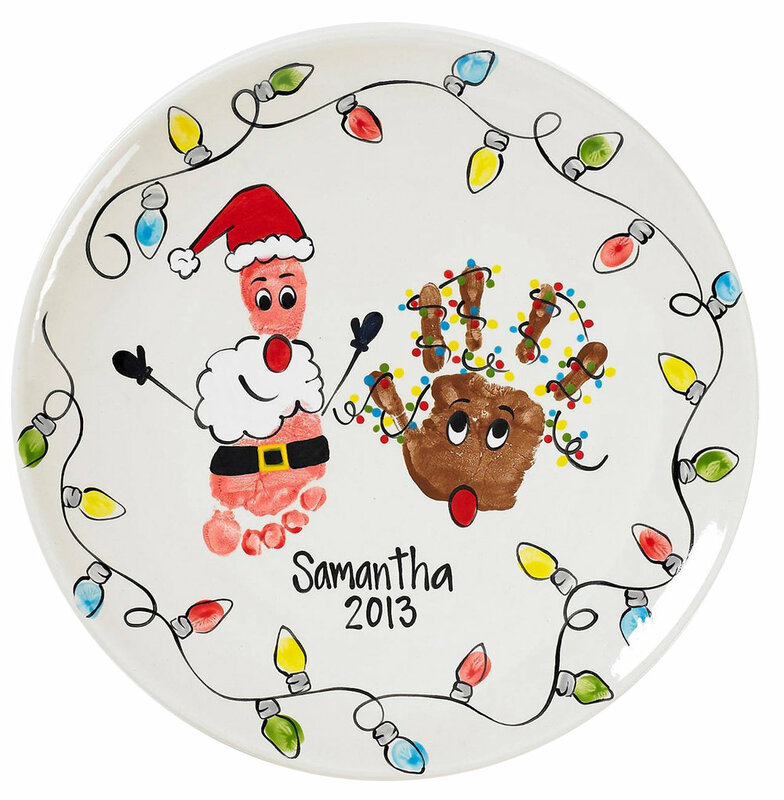 Pricing starts at $20 & up and is all inclusive to make and paint it yourself. We even have stamping tools you can use such as letters, numbers and decorative shapes. 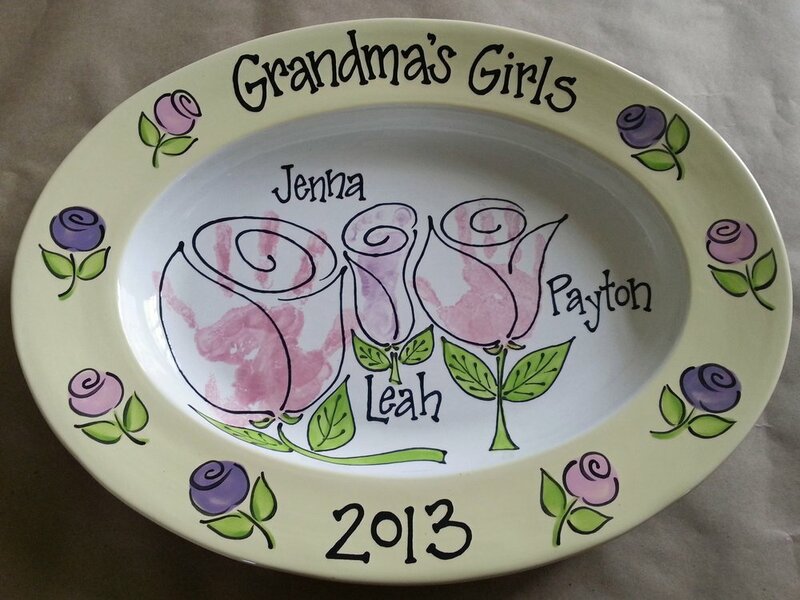 Custom painting or lettering by a studio artist is available at an additional cost. Please note that two visits/ two firings are required to complete your artwork if you plan to paint it yourself. Please call ahead if you would like to make a clay imprint so we can prepare materials for you. Available by appointment only at a mutually convenient time when we can schedule a dedicated staff person to assist with the prints, please call us at 860-517-8553. Available by appointment only. Clay pieces need about 7-10 days to dry and fire to bisque (white hardened pottery) so that you may come back and paint it at your convenience. It then needs one additional glaze firing which takes about another 7 days. Decorate your own clay imprint with letters and other decorative stamps, or place an order to have us custom design and paint it for you. 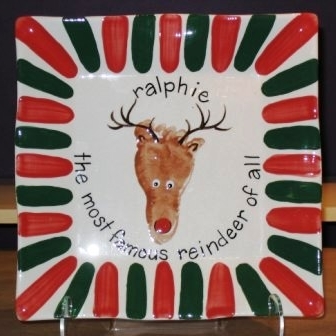 Custom painted pieces are generally finished within 3-4 weeks from the date the imprint was made. 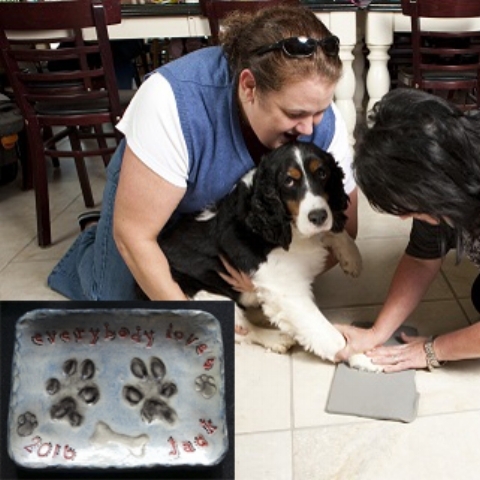 Available by appointment only, you can bring your pet in to press their paw print into clay. Keepsake ornaments, plaques, or change dishes are a wonderful way to preserve the memory of your furry family member.